We've talked before about Ciao's Italian Restaurant... such a great spot for a romantic dinner or a tasty (and reasonably priced) lunch. 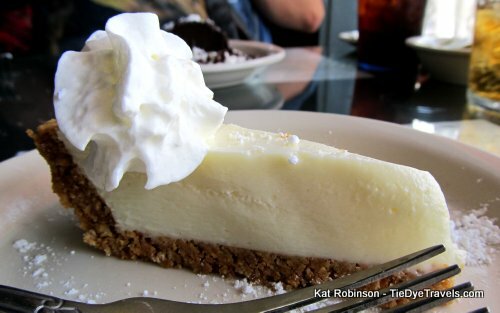 Ciao's offers one thing I can truly appreciate — a signature Key Lime pie flown in from Key West, FL. Better yet, it's the perfect size. That is, you have the option of getting a whole piece or choosing the half sized dessert for $2.99. Considering the size of portions at Ciao, the filling pasta, the eponymous crab cakes, the foccacia bread, the steaks, the salmon, the... er, yeah. I rarely even have room for dessert in the first place. But this pie... I turn down the luscious chocolate truffle for this cool slice, almost every time. It's pungent with the flavor of Key Limes, not too sweet and not too crusty. I mean, there's a good crust-to-pie ratio. Delicate dairy-filled pies like this don't need a lot of graham cracker on the bottom. It's the equivalent of a sorbet after a French meal. It's not particularly Italian. But oh my, is it good. You’ll find Ciao’s Italian Restaurant at 407 W. 7th St. in downtown Little Rock. (501) 372-0238.